I recently had the opportunity to review Introducing THEO -- Teaching Children God's Word by Whitestone Media. 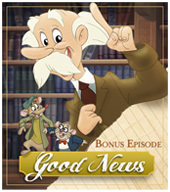 The DVD I received had the bonus video of "Good News" on it as well as the "Saving Faith" episode. The theology on the video I saw was sound. One episode explained how we can become a Christian, and the other episode was about how faith pleases God, using Abraham as an example. This would be fantastic for use in a children's outreach. I expect Theo will become a mainstay of Christian children's entertainment in the future. I highly recommend this product to anyone who is a church worker, parent, or have children in your life! Theo Presents is designed to serve as a multi-media resource tool that will help men, women and children fulfill the Great Commission of Christ, to go into all the world and make disciples and to teach those disciples Godʼs Word. The multi-media outlets include a DVD series, curriculum, books and iPhone/iPad app. Each of these facets are designed to work with one another or individually. Theo was created to reach kids of all ages. The lessons and teachings of Theo can be used for Sunday school lessons, Christian school curriculum, missions, evangelism and homeschooling. Mike Joens has produced and directed scores of animated commercials for toy companies such as Milton Bradley, Hasbro, Kenner, McDonaldʼs and Playskool. In addition to commercial work, he produced and directed the animation segments for the award-winning video series “McGee and Me,” as well as the animated “Adventures in Odyssey” for Focus on the Family. After a waiting period of over 30 years, God opened the doors to Joens for the production of “Theo Presents.” At last, the dream of a cartoonist, called to teach the Word has come true. It is Mikeʼs hope that God will use Theo to present the Gospel of Jesus Christ to children and adults in every country of the world! What sets THEO apart from anything we've worked on? The Buy 1 - Give 1 campaign! For every Theo DVD purchased, Whitestone Media and Child Evangelism Fellowship® will send a child in need their very own copy of Theo. You can log onto TheoPresents.com after making your own purchase, and select the region of the world you'd like another copy of Theo to be sent. Disclosure of Material Connection: I received one or more of the products or services mentioned above for free in the hope that I would mention it on my blog. Regardless, I only recommend products or services I use personally and believe will be good for my readers. I am disclosing this in accordance with the Federal Trade Commission's 16 CFR, Part 255: "Guides Concerning the Use of Endorsements and Testimonials in Advertising"
I have been given the opportunity to give a DVD away to TWO of my readers. The giveaway lasts until September 19 at 11:59 Eastern Time, open only to the USA. Please leave a separate comment for each way you enter as I use random.org to pick my winners. Winners have 48 hours after being contacted to respond or I'll pick other winners. Please leave contact information in your comment if it's not in your blogger profile so I will have a way of contacting you if you win. I'd like to win this to watch with my baby and also to be able to lend to our church or school for programs. 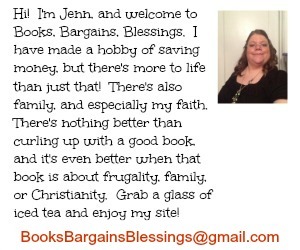 I would love to win this as I am a new Sunday School teacher and this will help me plan and present lessons. Thanks!! I am now following you via GFC! I'd like to win this to have a wholesome DVD to be able to enjoy with my son. I would like to win because I know my tot would love it. I learned that the overall purpose of Theo Presents is to provide as many tools as possible to help present the Gospel to many kids and audiences around the world.